Some people make us scratch our head in wonder and wipe our eyes in sorrow. Samson was such a man. He had everything he needed to be outstanding, yet he ended his life as a blinded slave in the enemy’s camp. Most everyone knows of his exploits as the superhero of the Old Testament. And even though God used him, Samson could have been so much more. Let’s trace some of the downhill steps Samson took to lose his superhero cape. Teaching: "A Superhero Loses His Cape"
Some people make us scratch our head in wonder and wipe our eyes in sorrow. Samson was such a man. He had everything he needed to be outstanding, yet he ended his life as a blinded slave in the enemy's camp. Most everyone knows of his exploits as the superhero of the Old Testament. And even though God used him, Samson could have been so much more. Pastor Skip traced some of the downhill steps Samson took to lose his superhero cape. Though Samson was empowered by the Spirit, he was emptied of power by his pursuit of the flesh. He was mentioned in Hebrews 11:32 as an example of faith, but he was not a faithful man. God wanted to use Samson as a prime deliverer, but he turned out to be a poor example. In the midst of his pursuit of a Philistine woman, Samson disregarded his parents' advice; they wanted him to marry a Jewish woman, based on God's command not to intermarry with pagan tribes (see Exodus 34:12-16; Deuteronomy 7:3-4). The first downward step a person takes is disrespect for their parents. Parents model God's authority. When we don't let God rule over us, He will overrule us. God will accomplish His purposes in spite of us. Probe: Read Exodus 20:12. What does it mean to honor your parents? As a Nazarite, Samson took a vow of consecration to stay away from wine, keep his hair uncut, and not touch dead things. He disobeyed in all three areas. Samson went through a vineyard, breaking the vow concerning wine, and later touched a lion's carcass. Samson's problem was first and foremost with God. He chose doting on himself over devotion to the Lord. Probe: Read Ecclesiastes 5:4-5 and Matthew 5:37. Why is it important to keep your promises to God and others? Samson hosted a wedding feast with wine, once again breaking the Nazarite vow. His father was there, along with thirty other men he presumably didn't know. According to Jewish tradition, the friends of the bridegroom would have been at Samson's wedding. Where were his friends? Maybe Samson didn't have friends. If he did, he didn't invite them to his wedding. Either way, this shows that Samson was a loner; he raged against the wise judgment of others (see Proverbs 18:1). Friends provide the support and standards of godly advice. Samson's distance from his friends is another mark of his downward spiral. Probe: Discuss the positive and negative role friends have in influencing your behavior and decisions. Share some examples. Weddings lasted a week in Samson's day—his didn't have a good start: his bride deceived him, his groomsmen betrayed him, and he referred to his bride as a cow. At the wedding, Samson told a riddle. The substance of the riddle was based on his sin, making fun of the seriousness of his situation. Some people have a tendency to deal with sin using unhealthy mechanisms—such as unwarranted humor—as a means to detract from their depravity. Probe: Read 1 John 1:9. What is the proper way a believer should deal with sin? Samson had a cold heart and a hot head. He killed thirty men to pay off a debt. He further defiled his vow by touching the dead. Samson didn't go home to his wife, but went back to his parents, and his wife married another man. One mistake led to another—one rebellion against God fuels others, creating a downward spiral. Those who fly off in a rage never make a good landing. Compare Samson's anger to what the apostle Paul taught about anger in Ephesians 4:26. Take your God seriously. There is no record of Samson praying until the end of his life, after he had been betrayed, captured, and blinded. Choose your friends wisely. You will eventually become like the people you hang out with the most. Make your choices cautiously. Don't make impulsive decisions (see Proverbs 8:5). Having superpowers doesn't make you a superhero. What really makes a superhero is when a person is empowered by the Holy Spirit in daily life to reach the potential God has for them. Connect Up: Though the Lord is full of grace, discuss why you think God allows people like Samson to disobey Him. Is there ever a point of no return with the Lord? Use Hebrews 6:4-6 as a point of discussion. Connect In: How do individual actions (even poor ones like Samson's) affect the body of Christ? Using the body analogy Paul used in 1 Corinthians 12:12-31, discuss the importance of unity and cooperation within the church. Connect Out: Jesus said concerning people, "You will know them by their fruits" (Matthew 7:16). First, discuss what good fruit looks like (see Galatians 5:22-23). Second, discuss how the fruit we produce influences and affects the nonbelievers we are trying to reach with the gospel? 1 Now Samson went down to Timnah, and saw a woman in Timnah of the daughters of the Philistines. 2 So he went up and told his father and mother, saying, "I have seen a woman in Timnah of the daughters of the Philistines; now therefore, get her for me as a wife." 3 Then his father and mother said to him, "Is there no woman among the daughters of your brethren, or among all my people, that you must go and get a wife from the uncircumcised Philistines?" And Samson said to his father, "Get her for me, for she pleases me well." 4 But his father and mother did not know that it was of the LORD--that He was seeking an occasion to move against the Philistines. For at that time the Philistines had dominion over Israel. 5 So Samson went down to Timnah with his father and mother, and came to the vineyards of Timnah. Now to his surprise, a young lion came roaring against him. 6 And the Spirit of the LORD came mightily upon him, and he tore the lion apart as one would have torn apart a young goat, though he had nothing in his hand. But he did not tell his father or his mother what he had done. 7 Then he went down and talked with the woman; and she pleased Samson well. 8 After some time, when he returned to get her, he turned aside to see the carcass of the lion. And behold, a swarm of bees and honey were in the carcass of the lion. 9 He took some of it in his hands and went along, eating. When he came to his father and mother, he gave some to them, and they also ate. But he did not tell them that he had taken the honey out of the carcass of the lion. 10 So his father went down to the woman. And Samson gave a feast there, for young men used to do so. 11 And it happened, when they saw him, that they brought thirty companions to be with him. 12 Then Samson said to them, "Let me pose a riddle to you. If you can correctly solve and explain it to me within the seven days of the feast, then I will give you thirty linen garments and thirty changes of clothing. 13 "But if you cannot explain it to me, then you shall give me thirty linen garments and thirty changes of clothing." And they said to him, "Pose your riddle, that we may hear it." 14 So he said to them: "Out of the eater came something to eat, And out of the strong came something sweet." Now for three days they could not explain the riddle. 15 But it came to pass on the seventh day that they said to Samson's wife, "Entice your husband, that he may explain the riddle to us, or else we will burn you and your father's house with fire. Have you invited us in order to take what is ours? Is that not so?" 16 Then Samson's wife wept on him, and said, "You only hate me! You do not love me! You have posed a riddle to the sons of my people, but you have not explained it to me." And he said to her, "Look, I have not explained it to my father or my mother; so should I explain it to you?" 17 Now she had wept on him the seven days while their feast lasted. And it happened on the seventh day that he told her, because she pressed him so much. Then she explained the riddle to the sons of her people. 18 So the men of the city said to him on the seventh day before the sun went down: "What is sweeter than honey? And what is stronger than a lion?" And he said to them: "If you had not plowed with my heifer, You would not have solved my riddle!" 19 Then the Spirit of the LORD came upon him mightily, and he went down to Ashkelon and killed thirty of their men, took their apparel, and gave the changes of clothing to those who had explained the riddle. So his anger was aroused, and he went back up to his father's house. 20 And Samson's wife was given to his companion, who had been his best man. We've all had to learn a few lessons the hard way, but it's far better to learn from someone else's mistakes. The Bible is full of stories we can glean from--positive and negative--about what to do and what not to do. Satan was filled with pride. Lot became complacent. And Achan let greed steal his blessing. Join us for Crash & Burn as we learn to fly by looking at the lives of those who fell. Hello, and welcome to this message from Pastor Skip Heitzig of Calvary, Albuquerque. We pray that this message strengthens your relationship with the Lord. If it does, we'd love to hear about it. E mail us at my story calvaryabq.org. And if you'd like to support this ministry financially, you can give online securely at calvaryabq.org/giving. Some people make you scratch your head and wonder, and wipe our eyes in sorrow. As we continue in the series Crash and Burn, we learn about Sampson, a man who had the opportunity to be outstanding but ended his life as a blind slave. In this message, a superhero loses his cape. Skip traces the steps that led Sampson down hill. Now we invite you to turn in your Bible to Judges chapter 14 as he begins. Would you please turn in your Bibles to the Book of Judges chapter 14. Judges chapter 14. So Batman and Robin went camping. And after they cooked their meal and set up their tent, they fell asleep. And in the middle of the night, Batman woke Robin up and he said, Robin, what do you see? And Robin said, well, holy jeepers, Batman. I see lots and lots of stars. And Batman said, and what does that tell you, Robin? Robin said, well, astronomically, it tells me that there are probably millions, if not billions of stars, and potentially billions of other galaxies. Astrologically, it tells me that Saturn is in Leo. Chronologically, I can deduce that it's approximately 3:15 in the morning. Theologically, it shows me that God is very big and we are small and insignificant. Meteorologically, I can deduce that we're going to have a beautiful day tomorrow. And then he said, what does that tell you, Batman? Batman said, dummy, somebody has stolen our tent. You know, you can be a superhero and not be super smart. And we're studying in the Book of Judges, chapter 14, the super hero of the Old Testament, somebody everyone has heard of. If you've been to Sunday school, everybody knows stories about Sampson. His story is found in the four chapters of the Book of Judges, chapters 13, 14, 15 and 16, a full one fifth of the book is devoted to this judge known as Sampson. And Samson really was a complicated person. He was sort of a puzzle, a walking enigma. He was empowered by the spirit of God, we are told, but he yielded to the appetites of the flesh. He was strong before men. He was weak before women. He could conquer the enemies around him, but he could not conquer the biggest enemy inside of him. He's a guy who fought the Lord's battles by day, but disobeyed the Lord's commandments by night. Samson was what James said is a double minded man, unstable in all of his ways. Interestingly, the name Samson means sunny, like S-U-N-N-Y. Sunny. Brightness, or bright one. I'm sure he brought lots of joy and laughter into his parents' home, and they-- here come Sunny. But what's ironic about that is, he dies unable to see anything. He is blinded by the enemy in his camp as he takes his life along with that of the Philistines, a blind slave. Something else you should know about him before we can even get into the text. He is found in Hebrews 11. You know, that-- the Hall of Faith, that chapter of faith in Hebrews 11. He is named in a sentence among a host of others as being a person of faith from the Old Testament. But I want to say, though he was a man of faith he was not a faithful man. He was not faithful to his parents. He was not faithful to his vows. He was not faithful to his God. Yet God did use him in a strange kind of a way. You'll see part of it. We don't have time to look at all of these chapters. But we're going to look at chapter 14. So I want to give you the setting. The setting is that the Philistines have occupied the land. I know that you've heard of the Philistines. Let me just tell you who they were. Philistines were people from Greece, the Agean Sea region, who in 1200 BC decided to leave where they were and migrate to the southern Mediterranean climate. So they attacked Egypt in 1200 BC. That didn't go very well. So they were forced northward. And they settled along the coast of Israel. So they became for hundreds of years perpetual enemies to the children of Israel. And they occupied five cities principally. Ashkelon, Ashdod, Gaza, Gath, and Ekron were all stronghold cities of the Philistines, so God will raise up judges-- that's what the Book of Judges is about-- to push them away and to take them out. And one of the principal ones is a guy by the name of Sampson. Now, Sampson is unsuccessful. He makes a little dent in the problem, but does not fix the problem, or he doesn't reach the potential that God had for him as a deliverer. And I want you to see why that is. Let's see how he crashed and burned. Sampson took five steps downward. And I want you to look at them with me in chapter 14. But let me say before we jump in that some of you may be taking one or more of these steps. Any one of them is bad. All of them together, will, I can guarantee you, cause failure. So let's look at the first downward step that he took. He disrespected his parents, verse one, Judges 14. Now, Sampson went down to Timnah. And he saw a woman in Timnah the daughters of the Philistines. So he went up and told his father and mother, saying, I've seen a woman in Timnah of the daughters of the Philistines. Now, therefore, get her for me as a wife. And his father a mother said to him, is there no woman among the daughters of your brethren, or among my people, that you must go and get a wife from the uncircumcised Philistines? And Samson said to his father, get her for me, for she pleases me well. Now, you need to know that Sampson did have a godly heritage. It was by divine Revelation to his parents that he would be born. And when he was born, he was raised to honor God. His parents dedicated him to God with a special vow called the vow of a Nazarite. That might ring a bell that some of you, if you know the Old Testament in the book of Numbers, chapter six, there was a special vow of holiness, or vow of dedication, consecration, called the vow of a Nazarite. As soon as Samson was born, the last verse of chapter 13 of Judges says the Lord blessed him. I always like to read that. The Lord blessed him. And the Spirit of the Lord began to move upon him. But as soon as we get to the very next chapter, which is the initial stages of his public life, his first public act is to go to the wrong place and look for the wrong person. He goes down to Timnah about four miles from where he was from. Timnah is in Philistine country. And he went down there. And of course, he's speaking geographically, topographically he went down. But I also see this as a spiritual reference point. As soon as he's out of the chute, his life goes south. He goes down to Timnah and of course, when you hang out in the wrong places, you usually hook up with the wrong people. And so it says that he saw a woman of the Philistines. And he looked at that beautiful Philistine chick, and he thought, man, love at verse sight. I got to have her as my wife. Hadn't even spoken to her yet. According to the custom of those days, he went to his father and said, I like her, get her for me as a wife. So what this really was not love at first sight. This was lust at first sight. He is living through his eyeballs. He is going completely by his senses, which by the way, in our culture we have taught men the same thing. Whether it's by the beautiful models in magazines that display a product, or it's by mannequins in a store, who on Earth could fit into the close a mannequin wears? We teach a man, she said, we are teaching young men to look for women that do not exist, or that have a special meal need if they do exist. I mean, these are values that we instill in young men, so that-- I speak to guys all the time about what they want in a wife. And you know, it's like, well, I don't want much. She just has to have the IQ of Albert Einstein. She has to be a supermodel and an Olympic athlete. That's all. And my first question is, why on Earth would she ever be interested in you? But his parents thought, you know what, don't marry that girl. Marry one of your own girl, a good Jewish girl. Now, why would dad say that? Why would mom and dad? Are they just stupid? Are they just so narrow minded? They don't understand. This is real love. They don't get it. Probably those thoughts were going through Sampson's mind. But the reason they said this is because they knew their Bibles. They knew Deuteronomy 7. They knew Exodus chapter 34, where God said, when you go into the land that you are going into, that I'm bringing you into, do not intermarry the people of that land. Don't give your daughters to their sons. Don't take their daughters for your sons, because-- God said-- those daughters will turn the hearts of your sons away from me. Don't marry an unbeliever. The unbeliever will steer you away from God. But can you hear the impudence in his voice? She pleases me well. Get her for me. I mean, that's just sassy. If I spoke like that, my mom would have washed my mouth out with soap. And she did that a few times literally. He is just rude in his response to his father. Says in Proverbs chapter 30 verse 11, "there is a generation that curses their fathers, and does not bless their mothers." Samson was of that generation. I was impressed the first time I went to the south and I saw how they are taught manners in the south. It was a whole new level. I'm a Californian. So the best you get when you come into a room to a Californian is a hey, s'up? It's like, yeah, I acknowledge that you live. But that's about it. Not in the south. They stand up when a woman enters the room. They say, yes, sir, no, sir, yes, ma'am, no, ma'am. It's like-- it was culture shock to me. And I thought, boy, I like that. It's a whole nice and new level of respect. Well, Sampson didn't know those kind of manners. But notice something in verse 4. There's a footnote. It says, "but his father and mother did not know that it was of the Lord. That he was seeking an occasion to move against the Philistines, for at that time the Philistines had dominion over Israel." Now, I have to explain what that means. That doesn't mean you can live any way you want, make any choice you want, and God will-- God will cover you. It does mean that, when you don't allow God to rule over you, God may have to overrule you. That's what it means. So God wanted to use Samson as a mighty deliverer of the people in a different manner, in a longstanding effective manner. But he wouldn't let that happen. Sampson wouldn't. So God overruled him. When God cannot rule over you, he will overrule you. As Warren Wiersbe put it, God will accomplish his purposes either with us or in spite of us. And it was the latter that God did with him. So he disrespects his parents. That's the first step downward. The second is he disregarded his God. Verse 5. So Samson went down to Timnah with his father and mother. They're going to make the marriage plans now. And they came to the vineyards of Timnah now, to his surprise, a young lion came roaring against him, and the Spirit of the Lord came mightily upon him. And he tore the lion apart as one would have torn apart a young goat. Though he had nothing in his hand. But he did not tell his father or mother what he had done. Then he went down and talked with the woman. The first record that he's even talking to this gal he's in love with. And she pleased Sampson well. After some time, when he returned to get her, he turned aside to see the carcass of the lion, and behold a swarm of bees and honey were in the carcass of the lion. He took some of it in his hands, and he went along eating. When he came to his father and mother, he gave some to them. And they also ate. But he did not tell them that he had taken the honey out of the carcass of the lion. So he's traveling down to Timnah with mom and dad. And evidently, he leaves the main road, and goes through a vineyard without them. A lion attacks him. And you know the story. Here's the question, what's a Nazarite doing in a vineyard? Now, I want to refresh your memory. A Nazarite vow, which Sampson took, involved three things. Number one, you don't cut your hair. You let it grow. So they were like the original hippies. But with the purpose. The idea of the long hair was a sign of humiliation. That's number one. Number two, a Nazarite wasn't allowed to touch a corpse because they would become defiled. So even if her relative died, they couldn't be around a corpse, which means they wouldn't have participation in the funeral of even a parent. So it was quite a vow to take, quite a sacrifice to make. Third, a Nazarite could drink no intoxicating drink at all, no wine, no intoxicating drink. Could eat no grapes. Could eat no raisins at all, nothing from the fruit of the vine. It's just interesting to note that he is walking through a vineyard. It's dangerous for a Nazarite to even walk through the vineyard, because you're just kind of placing yourself in a temptable position to break your vow and eat some grapes. Maybe not a big deal, but to a Nazarite it is. Now, the principle I find is one that I see. Some Christians will ask questions like, hey, can I do that and still be a Christian? Is it OK if I get involved in this and still be a Christian? Is like wrong line of questioning. It's not like how far up to the edge can I get. But some believers will sail their ships so close to the lake of fire that their sails get singed. You don't want to live that way. Sampson is living that way. According to verse 9, on his way back he takes honey from a lion's corpse. Now, again I remind you of the vow that he;s taken. He is a Nazarite. And one of the things Nazarites can't do is touch a corpse. So reaching in and grabbing honey from a corpse of a lion is something that will break his vow. He's becoming defiled. Now, he's ceremonially defiled. He's already relationally defiled. He disrespected his parents. He's already morally defiled, because all he's thinking about is what he can see with his eyes and looking at a Philistine chick because she's pretty. Now, he's ceremonially unclean. All of that to say here's a Nazarite who is not taking his vows very seriously. And there's a good reason for that. It's because they're not important to him. They're just not that important to him. Maybe at one time they were, but they're not now. I meet people all the time who will say, oh, I used to go to your church. In fact, you dedicated me when I was a baby. And I always ask, did it work? What do you mean did it work? I mean, are you-- are you still dedicated to the Lord? Are you following? Well, you know, I've had a few setbacks. I go to church twice a year, Easter and Christmas. I'm there. Count on me. And you see, whatever past experience you've had, whatever past expression of faith you have made, it's all invalid unless it's translated into the present experience. Jesus said, many will say to me in that day, Lord, Lord, have we not prophesied in your name? Have we not cast out demons in your name? Have we not done wonderful things in your name? And I will declare to them, I never knew you. Depart from me, you who practice lawlessness. The problem that Samson had with women was really a problem Sampson had with God. God wasn't first in his life. God wasn't supreme in his life. The Bible is a word for that. It's called idolatry. Anything or anyone that replaces supreme devotion to God is an idol. So I know that God is your God by creation. You're here. You're alive. He created you. I know that for many of you God is your God by redemption. He saved you. My question is, is God your God by devotion? Are you devoted to him? Well, I've been dedicated to God. Great. Are you devoted to him now? Samson was not. He disregarded his God. Let's look at the third step he takes. He's going downhill with every step. He distances friends. He distances friends. In verse 10-- now, we're going to get two verses. And as we read them, I want you to notice what is there and what's not there. Verse 10, so his father went down to the woman. And Samson gave a feast there for young men used to do so. And it happened when they saw him, that they brought 30 companions to be with him. Now, notice what's there. First of all, there's a feast. And the word for feast, the Hebrew word in the text for a feast, is a drinking feast. OK, so once again, he's taken the vow of a-- a vow of a -- Nazarite. Nazarites don't drink intoxicating drink. This dude's having a beer bash. It's a bachelor party. Yes, young men used to do so, but not Nazarite young men. Not this young man. So this Nazarite has a drinking party and intoxicating beverages would certainly be a part of that. And notice his dad is with him. Now, I don't know why his dad is with him, but I notice it is in the text, so I deal with it. One commentator says, perhaps his father was there to reach out to his son in one sort of last attempt to stop a marriage that he couldn't sanction. Is it just a way to say, please, son, don't do this. So that's what's there. What I want you to see is what's not there. There are 30 philistine men in the groom's party that he doesn't even know. They give him 30 dudes off the street to be part of the wedding party. If he doesn't know her, he certainly doesn't know them. But they just bring them in. Here's my question, where are his friends? Where are Sampson's friends? Why didn't he bring his own? Now, listen carefully, in Jewish weddings there was a group of men called the friends of the bridegroom. Jesus even mentions it in Matthew 9. The friends of the bridegroom. Where the friends of this bridegroom? It suggests to me that Samson didn't bring any of his friends. They had to round up 30 Philistines to be his new best friends for his own wedding. So why didn't he bring his friends? Well, either he didn't have any, or they didn't want to come with him and be a part of this wedding. It's one of those two options, either he didn't have any, or they didn't want to come and be a part. Or he just didn't tell anybody. So he didn't bring his own friends. One thing we know for sure about Samson, whether you read it in chapter 13, 14, 15 or 16, is this guy was a loner. Know anybody like that? You mean, a pure loner. There is no record of him marching with an army, working with a band of soldiers. We never read of him strategizing with other leaders. We never see him surrounded by good friends. He always acts alone. Always alone. And that is not good. That is not healthy. Proverbs 18 verse 1, a man who isolates himself seeks his own desire. He rages against all wise judgment. That is Sampson. He's isolated himself. He rages against wise judgment, his parents, his God, his vows. He's acting alone. And a person like that is just easy pickings, easy prey for the enemy. And one of the things I love about computers is this thing called spell check. In one hand, it drives me nuts, especially with my smartphone, because it's like thinking it's smarter than I am. And I write a word down. It corrects it. And it sends. And it's like, no, I didn't mean to say that. And you have to then correct the correction, right? But when I work in a Word document, like on my computer, I love spell check. Because I'm not always the best speller. I try to be, but I forget how things are spelled. And so, it kind of stops and goes no, you're wrong. And there's three options you can pick from these three words. Would any of these words good for you? I go, yeah, actually, I like that one. OK, good. And I would spell it right. So thank you. Wouldn't it be great to have spell check in life? Like mistake check. You're going around doing your thing, and then every day something comes-- you may not want to do that. That's kind of a bad move. Let me give you three options to choose from. Wouldn't that be great? Let me tell you something. You have that. They're called friends. Real friends will do exactly that. They're your spellcheck. They're your mistake check. Your good friends who know you will say, I see you walking down a bad road. I know you. I know your background. And I love you enough to get in your grill and tell you, not good. You may want to check another option. Another road. Sampson had parents whom he disrespected. And he probably had friends whom he distanced, pushed away. So you can see these downhill steps. He disrespected his parents. He disregarded his God. He distanced his friends. Let me give you a fourth step downward in this chapter, he downplayed his failure. Let's pick it up in verse 12. This is now the wedding feast. Samson said to them, these 30 new best friends, let me pose a riddle to you. If you can correctly solve and explain it to me within those seven days of the feast, then I will give you 30 garments, and 30 changes of clothing. But if you cannot explain it to me, then you shall give me 30 linen garments, and 30 changes of clothing. And they said to him, pose your riddle that we may hear it. And he said to them, out of the eater came something to eat, and out of the strong came something sweet. Now, for three days they could not explain the riddle. But it came to pass on the seventh day that they said to Sampson's wife, entice your husband that he may explain the riddle to us, or else we will burn you and your father's house with fire. Can I just say, you don't want guys like this at your wedding. Have you invited us in order to take what is ours? Is that not so? Then Sampson's wife wept on him and said, you only hate me. You do not love me. You posed a riddle to the sons of my people. But you have not explained it to me. And he said to her, look, I haven't explained it to my father or mother. Should I explain it to you? And so she wept on him the seven days while their feast lasted, and it happened on the seventh day that he told her, because she pressed him so much. Then she explained the riddle to the sons of her people. So the men of the city said to him on the seventh day before the sun went down, what is sweeter than honey, and what is stronger than a lion? And he said to them, if you had not plowed with my heifer you would not have solved my riddle. Now, this marriage is not off to a very good start. He's got a wife who's crying for their honeymoon. He's got 30 guys who want to kill his wife and father-in-law. And he calls his wife a cow. Right? So this is not good stuff happening. The wedding feast lasted for seven days. During this seven day feast, as a matter of protocol, it was standard practice to pose riddles, to have little word games, to have little conversations that would be like a battle of the wits, a friendly battle of the wits, it was very commonplace. But what I want you to notice is the subject of Samson's riddle. What is the subject? It's the honey he took from the carcass of a lion. In other words, Samson constructed his riddle based on the experience of his own sin. He made a joke out of his sin. It's very light hearted, that it works its way into a riddle. I mean, it's bad enough that he disobeyed God. But it takes a special kind of callousness to make a joke out of disobeying God. Well they can't figure it out, coax your husband. She tells the riddle. And the wedding feast is about over. There is a human tendency to not deal with our issues. We all have our issues. We all got our stuff. And one of the human protection devices that we have is to deflect. So if somebody gets a little too close to our issue and we feel uncomfortable, we deflect. We change the subject. And some are very good at deflecting. There are masters of it. Or they make jokes about it. They try to make a light of it. And when you live that way, you just become more isolated and more alone. Doesn't solve the problem. This is another step downward for Sampson. He disrespected his parents. He disregarded his God. He distanced his friends. And now he downplayed his failure. Notice that phrase. His anger was aroused. And he went back to his father's house, and Sampson's wife was given to his companion. That's his best man who had been his best man. Sampson is a man with a cold heart and a hot head. To pay his debt, he goes 23 miles away, 23 miles away to Ashkelon kills 30 dudes who are not even a part of the party. Nobody knows them. He doesn't know them. The 30 companions don't know them. He kills them, steals their Armani suits, and brings him back to pay off his debt. Does this guy have an anger problem? He goes from DEFCON 4 to DEFCON 1. He goes nuclear. It's like, OK, I lost the bet? I'm going to go kill 30 people to pay off my debt, who are unrelated. Why did he go so far away? It's pretty easy to figure out. Because he could travel back faster than the news would travel back of what he had done. Now, in order to get 30 pairs of garments, 30 sets of clothing from 30 dead men, you have to touch the corpse, which makes you defiled further. So he just keeps going down this path. We don't have time to look at it. But in the very next chapter, on another occasion, Sampson, because he's angry, to get even, takes 30 foxes, ties their tails together, lights them on fire-- so that's animal abuse-- lets them go through a field. And the fire of the tails of the foxes gets the crops going, and it burns all of the Philistines crops. This dude has an anger issue. OK. After he kills a 30 man, he doesn't even go to consummate the marriage. He goes back to his parents' home, we're told. And look at the last verse. Look what happens. While he's away, his wife marries the best man. I mean, this sounds like a Jerry Springer Show. It's been said those who fly into a rage always make a bad landing. This is a very bad landing. This is bad choice after bad choice after bad choice. Do you ever wonder how people like this with such potential, such empowerment by God's spirit, such a godly family and godly upbringing can end up like this? You are seeing the high cost of low living. Now, since we're doing this series in Crash and Burn, and we want to learn from those who fell, and we want to learn to fly, let me give you three quick takeaway points for this message for your life. Number one, take God seriously. Take God seriously. His parents made a vow and committed their son to the Lord, but their son squandered that. Want to find something, want to hear some interesting? Never once will you find Sampson praying until the end of his life, when he is chained to pillars, and he finally looks upward and he prays to God. Let me avenge my enemies. And he kills himself and he kills them. It's the only time we find him praying. And I know people who are like that. They really don't care much about spiritual things until there's a death, until there's a crisis, until there's a loss, until there's a health issue. You know, it's like when a September 11th happens, everybody standing around singing kumbaya and praying for one week. And that's it. Then it fades away. Take your God seriously. Second take away truth, choose your friends wisely. Take your God seriously, but choose your friends wisely. In the absence of Samson bringing good friends along, 30 bad friends were put in their place, because there was a vacuum. Somebody once said, if you want to sort with the eagles, you can't run with the turkeys. My dad used to say things like that to me. You eventually will become like the people you hang out with. That's who you become. And then third, make your choices cautiously. One of the things you understand in studying the life of Sampson is how impulsive he was, how impetuous he was. I see a girl. I want her. Yeah, but no I want her. And then he loses a bet. I'm going to kill 30 people. I mean, he's just all over the map. He's so impulsive. He's not cautious. He didn't take his parents advice. He didn't take any time to pray about it at all. I want to close with a proverb. Proverb chapter 8 verse 5. Let me read it to you. It's just, it's just good practical stuff. It says, "you who are simple, gain prudence. You who are foolish, gain understanding." He's saying, wise up. You can do this. Wise up. Listen to it in the message translation. Says, listen, you idiots, learn good sense. You blockheads shape up. How's that for straight talk from God's word? Superpowers don't make superheroes. What really makes a super hero is when a person is empowered by the Spirit of God in daily life to reach the potential that God has designed for each of you, each of us, to fulfill. Father, we have learned some tough lessons from a man who crashed and burned. Yes, you used him. Yes, he was even a man of faith. But he was not a faithful man. It was a weak faith. He could even be called a great man, a super hero, but your intention is for him to be an outstanding man. And he was far from that. Lord, I pray that we would let you in, we would let you have control, we would submit to a foreign will, yours. That our lives wouldn't be dominated by flesh and by our eyes. But we would take what those who have walked before us like parents, those who walk around us like friends, good friends, godly friends, will tell us. We'll bring them close, not distance them. And we pray more than anything else, that we would live close to your heart in Jesus' name. Amen. Even though God used Sampson, he could have been so much more. How will you reach the full potential God has for your life? We'd love to know. Email us at mystory@calvaryabq.org. And just a reminder, you can give financially to this work at calvaryabq.org/giving. Thank you for joining this teaching from Skip Heitzig of Calvary Alburquerque. One of the starkest truths we find in the Bible is its brutal honesty—it never flatters its heroes, and it never glosses over its villains. It presents the flaws, foibles, and failures of people in every generation. Just as Hebrews 11 is the Hall of Fame, showing the people of faith from the Old Testament, this series will look more at the Hall of Shame of those in the same time period. Why? So we can learn from their failures and not repeat them. 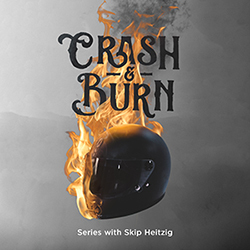 In this new series, Crash & Burn, we will learn how to fly by looking at those who fell. But the first "fall" was the worst, making way for every fall thereafter. Today we consider how Lucifer became Satan. After Satan’s own crash and burn, he took his evil scheme from heaven to the earth to which he fell and began to ensnare the first people God made (misery loves company). From this familiar story that most of us know so well comes five lessons that are eminently practical as we deal with life in a fallen world. In this series, we want to learn to fly by looking at those who fell. Adam and Eve went from flying to falling. What does that mean for us? If you think that just attending a worship service is enough to make you a good person, then consider this: the first crime was committed by a mad farmer right after church! The story of Cain killing his brother Abel highlights how dysfunctional the first family was and how sin immediately affected humanity—and still does. Today, we look at the biography of a murderer who went from adoring God to assassinating his brother. Some names summon noble thoughts. Other names evoke cautionary feelings. Lot is in the second category. Though he had everything he needed for spiritual success, his priorities were clearly fixed in the temporary pleasures of this life. Though the New Testament calls him righteous (see 2 Peter 2:7) because of his simple faith, his life could have been so much more. As it stands, Lot’s best years were squandered and fruitless. Meet a guy whose name actually means trouble. Achan was an Israeli soldier whose personal action brought a national reaction. When he crashed and burned, he took others down with him—his fellow soldiers, his family, and his country. How can one person do so much damage? And what should be done when we find ourselves in the fallout of failure (our own or others’)? Moreover, can there ever be a bright future for those experiencing such dim circumstances? It’s dangerous business to call the ruler of a country a fool. It would cost one’s life in ancient times. But here’s a case where the king himself admits his own folly. In a single autobiographical statement, King Saul admits his error. Yes, even leaders can crash and burn. Let’s look more closely at the career of a king who ended very differently than he began and see what went wrong. Moreover, let’s try to discover what things he could’ve done differently. Our year comes to us in seasons—winter, spring, summer, and fall—as the earth makes its journey around the sun. Our spiritual life can sometimes be the same, especially when we allow sin to intrude. The warm, alluring breezes of temptation can sneak up suddenly and, if acted upon, can bring the cool chill of broken fellowship with God. None of us are immune from enticement but all of us should be informed. Today we see King David’s crash and burn in his battle with lust. It’s bad enough when one person has their own crash and burn. It’s infinitely worse when one person takes everyone down with them. Jeroboam was a spiritual suicide bomber—plunging the nation of Israel into division, idolatry, and eventual judgment. Today we follow the steps he took and the reasons that led to his destructive path in hopes of strengthening our own resolve. There are 8 additional messages in this series.